We bought our fixer upper in January, when snow covered the yard and all the trees were bare. It has been so fun to see the yard come to life the last couple months, and I have been so excited to create a fun and chill space. I immediately envisioned a hammock area in the yard where I could swing, read, and relax while watching the kids play. 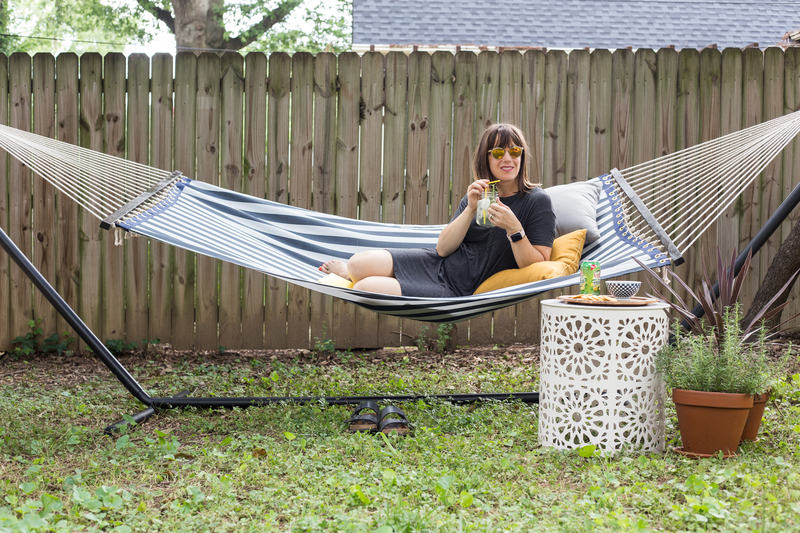 Here are my tips for creating a relaxing hammock area in your own yard! I have had many different types of hammocks through my years. They are all great for different types of scenarios. The woven rope hammocks are great for the beach, where sand can shake straight through. The parachute-style hammocks that squish into a bag are perfect for portability and camping. 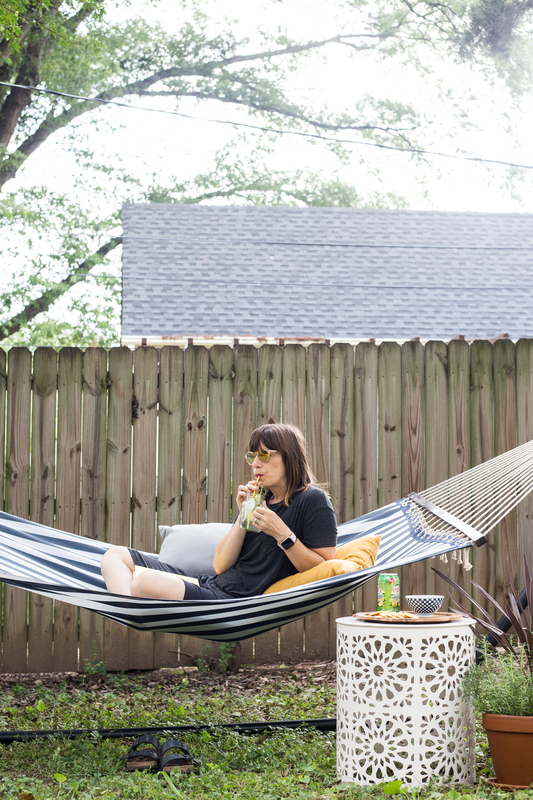 The large, flat hammocks with wooden spacer bars are perfect for relaxing backyard hangouts. 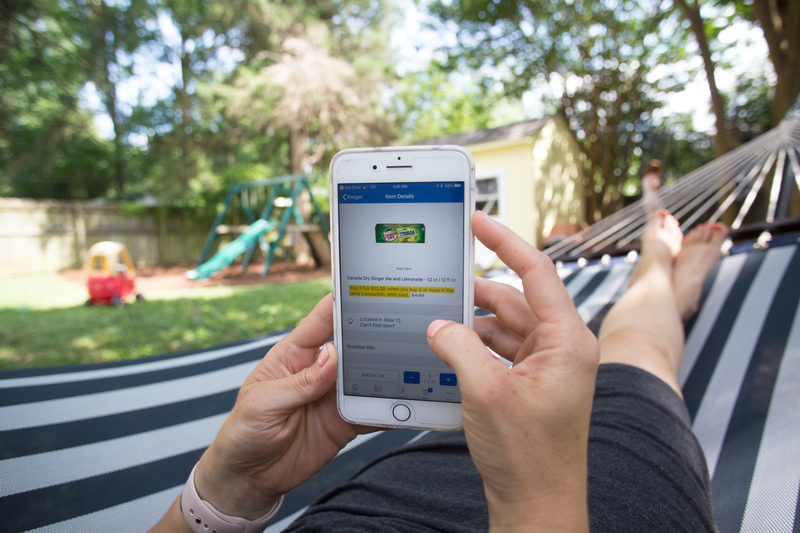 I chose a hammock made from synthetic material so it can withstand all of the rain, sun, and humidity of a Southern summer. A hammock is great for relaxing, but it isn’t very stable! 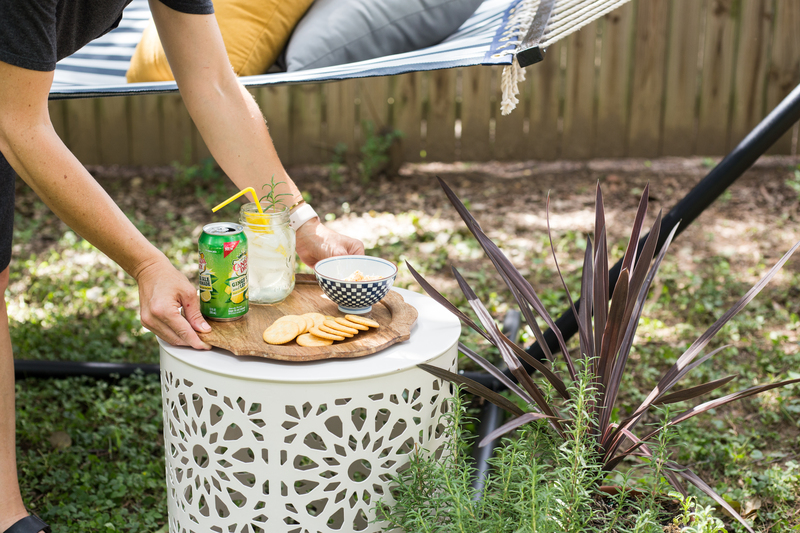 For practical use, you will need a small side table for drinks, snacks, books, and whatever else you don’t want rolling on top of you while you hang out. 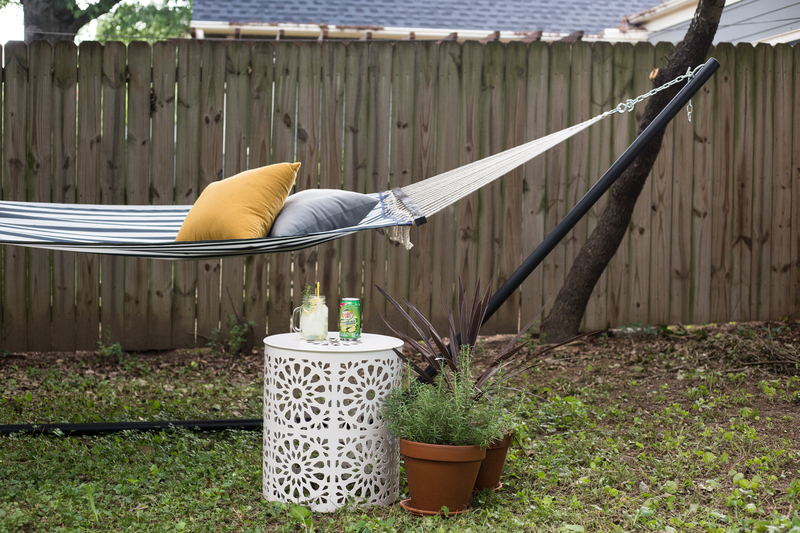 There are lots of great, small patio table options that are meant to live outside, so like the hammock, you can set it and forget it. 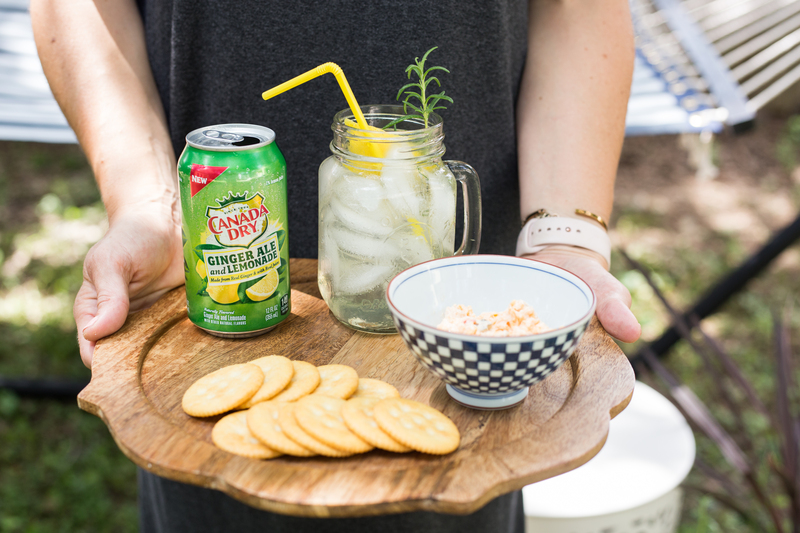 I have been loving the new Canada Dry Ginger Ale and Lemonade as a go-to summer beverage. The combination of sweet ginger ale and tangy lemonade is a winner and tastes like summer. 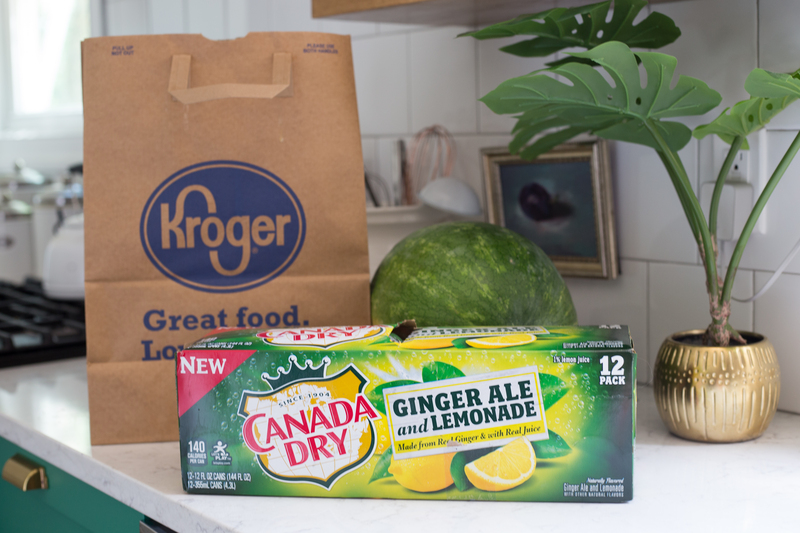 Dave has been doing some of our grocery shopping lately and taught me about Clicklist at Kroger where you can shop online, find what you need (like a 12-pack of Canada Dry Ginger Ale and Lemonade), and add to Clicklist. The groceries are pulled for you, so you can simply park and have them loaded into your car! Grocery shopping doesn’t get more relaxing than that! 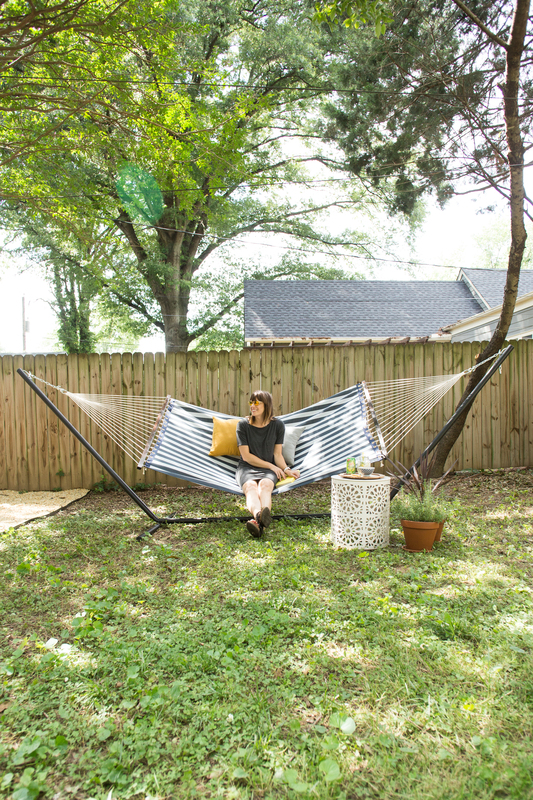 The hammock by itself is cozy but with a pillow or two, you won’t want to leave! 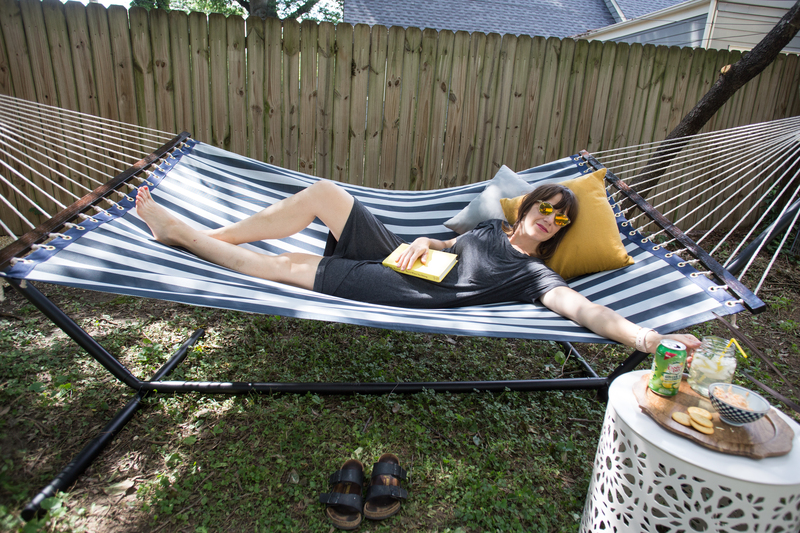 Especially if you plan to read on the hammock, having a pillow or two tossed on helps with being able to easily sit and lounge in many supported positions. I choose outdoor pillows that can easily live outside through all different types of weather, just like the hammock. In my opinion, the finishing touch to any space is to add plants! There is nothing that replaces the life and beauty of some fresh greenery, and the different textures, colors, and styles of plants means you can choose the best to suit your own yard. I moved my potted rosemary and another potted plant over from the steps of my back patio to this spot next to the new hammock, and I love the way they pull everything together. Not to mention that I love pulling a bit of fresh rosemary and adding it to my drink! 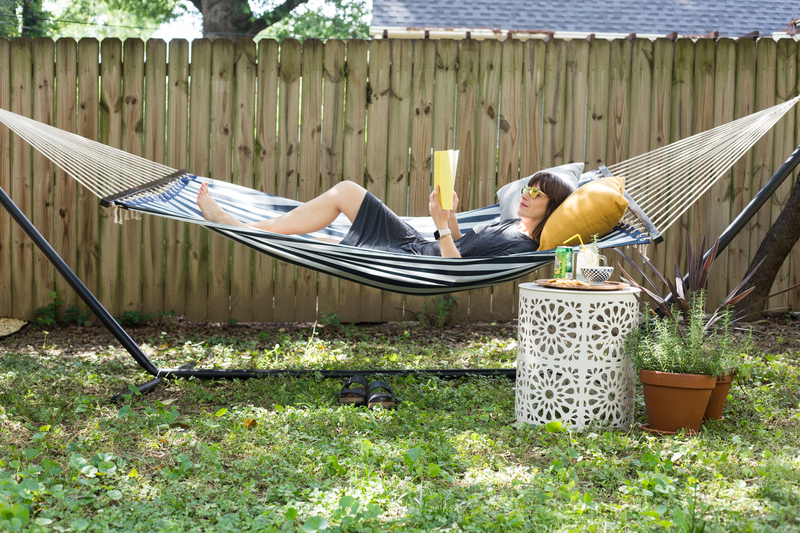 Once you have your hammock area set up and your easy snack and summertime beverage ready to go, all you need is a good book! I have been reading a lot lately, and am drawn mostly to inspirational non-fiction and memoirs. Here is a short list of some of my recent very favorites that still have me thinking about them. Educated by Tara Westover: A memoir of a girl raised off-the-grid and out of school in remote Idaho, and how she separates herself from her survivalist family and eventually graduates with a PhD from Cambridge University. A fascinating story that I couldn’t put down. Born a Crime: stories from a South African Childhood by Trevor Noah: A collection of stories and memories from growing up in Apartheid South Africa. A captivating story about race, poverty, crime, and culture. Seriously one of the best books I have read in a long time. I actually listened to it on audible, and Trevor is the narrator. His storytelling with his beautiful accent and proficiency in all of the different African languages quoted in the book makes it an incredible listen. This is How it Always is by Laurie Frankel: A fictional story about a family raising a young transgender son and how they navigate the unknown territory, transformation, and story of their family. I was gripped by the relationships between parent and children and felt the confusion, questions, and not always easy answers that we all sometimes face in life. It is poignant, touching, and raw. Girl, Wash Your Face by Rachel Hollis: A relatable and entertaining collection of stories, experiences, and lessons. This book addresses many of the lies we tell ourselves, and uncovers how we can move on from them to live a life even bigger and better than before. Rachel is funny, straightforward, and motivational. 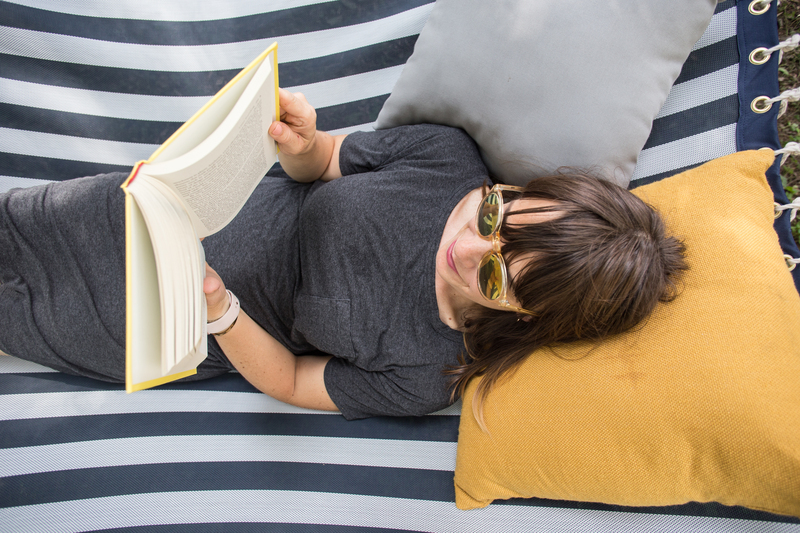 Okay, so you’ve got your comfy hammock, cold drink, soft pillows, and an interesting read. It looks like you are ready for a relaxing summer vacation in your own backyard!